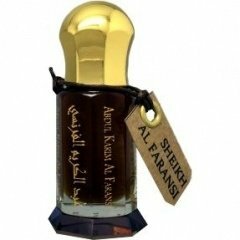 Sheikh Al Faransi (Perfume Oil) is a popular perfume by Abdul Karim Al Faransi for women and men. The release year is unknown. The scent is oriental-woody. The longevity is above-average. It is still in production. The perfumes of this Arab house, are of an infinite quality, and with little quantity they last an eternity. The output is honey amber and sweet, nothing cloying, with woody and floral nuances precious. The floral notes are indecipherable, you know there are flowers, but no idea what flowers they are, they float in the air like a crystalline mantle of floral nectar, that revolves on a honey-loving base, something dirty, but of incredible beauty. Then this sweetness lowers in intensity, like the floral notes, and take more body woody notes. Here the oud is perceived in all its splendor, nothing medicinal, but very dirty and animal, a very deep woody note with a nice residual halo of flowers and honey. The drying is a sandalwood amber, warm and sweet, very close to skin, with some shades of oud. A very masculine and woody perfume, not suitable for everyone, and of a mysterious beauty and with character. I liked it a lot, it's an arabesque preciousness, very related to western tastes. The performance is very good, staying in skin for 10 hours, with a moderate wake, something heavy at the beginning, to progressively finish in moderate, then the last hours of the perfume stays at skin level. This performance is in reference to a touch on the skin with the dosing rod, so imagine how long a 3ml vial of this elixir can last, and that this is not one of the most powerful in this house. The proper use of this perfume is nocturnal and for cold and temperate climates, although on a cold morning, it would also be a perfect champion. To me, particularly, this perfume I liked a lot, and sooner, than later, I will go for a larger bottle, because if we look at the cost / performance ratio, it is not an excessively expensive perfume for the quality it offers, and If you are looking for a different scent to what is currently on the market, it is a perfect candidate. I recommend at least your test. I'm no oud lover, but this is good! None of that barnyard scent, more woody and oriental with hints of flowers I can't define. Good value!